The first arrow has been unleashed with vigour by the BoJ as they target 2% inflation. The most recent CPI was +3.7% in May up from 3.4% in April. Job done? Probably not – prior to April the CPI had struggled to manage 1.5% and even the BoJ acknowledge that the recent rise is due to the consumption tax increase being largely passed on to consumers. The second arrow has been enfeebled by the imposition of a sales tax increase in April 2014, although the June 25th announcement of corporate tax cuts from April 2015 should lend it some renewed strength. Japanese companies held a record JPY222 trn in cash at the end of 2013. 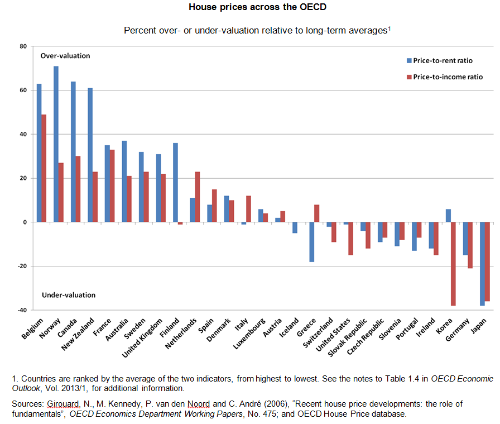 A cut in corporate tax to below the rate of Germany (<30%) will be an incentive to invest at home rather than overseas. 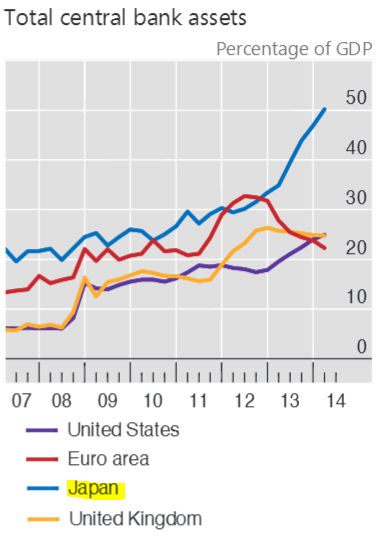 In Q4 2013 Japanese corporate invested JPY69 trn abroad – up 40% on the same period in 2012. The third arrow is “structural reform” but, as any democratically elected politician will tell you, that is a job best left to ones successor. So far there have been tentative attempts to reform agriculture and healthcare. Policies to encourage immigration and to promote female participation in the labour force are still awaited. As are the signing of free trade agreements with the EU, US and Japan’s Asian neighbours. To check on the glacial progress of the TTP the Office of the US trade Representative is a good starting point. With only one well honed arrow, the quiver looks bereft. But a Fourth Arrow – asset reallocation to domestic stocks – has been unleashed with stealth. Whether or not it hits its intended target, it will benefit a couple of asset classes in particular. Before examining the Fourth Arrow Option, however, I want to review the recent price action in the JPY, JGB and Nikkei. Like other major central banks, the BoJ is wrestling with the vexing issue of “transmission” – QQE has improved the fiscal position of Japanese banks but it has done little to stimulate credit demand in the wider economy. A significant portion of economic activity was front-loaded into the first quarter of 2014 to avoid the sales tax increase in April. Since then economic data has been weak. This was anticipated, and articulated, by the BoJ so it has largely been discounted by the markets – except, perhaps, JGBs which are toying with all-time low yields again this week (currently 0.54%). 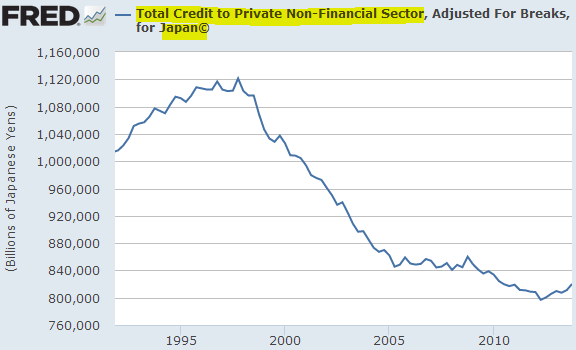 Some economists have argued that the absence of private credit growth is due to a lack of demand for credit. This absence, is thought to stem from entrenched deflationary expectations. I believe this is only part of the story; of much greater importance is the lack of private sector opportunity due to the increasing scale of the public sector. The chart below shows the divergence between private investment and government consumption. 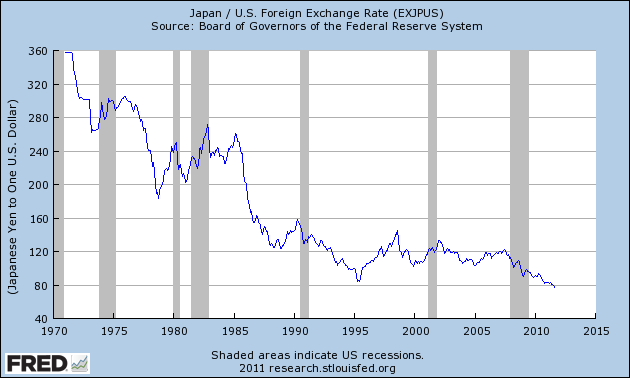 For those who wish to investigate this concept more closely, Federal Reserve Bank of St Louis head of research, David Andolfatto’s post, on his private blog site, What’s up with Japan? (G , evidently) makes interesting reading. … we show that a key to understanding why there is low pass-through from exchange rates into export prices is that large exporters are also large importers, so they face offsetting exchange rate effects on their marginal costs. In the case of Japan, the connection between the yen and production costs has been made stronger since the country replaced nuclear power with imported fuels in the aftermath of the 2011 earthquake. Developed country manufacturers are significant importers of semi-manufactured goods. A fall in the exchange rate makes these imports more expensive so the comparative advantage for exporters of finished goods is diminished by the increase in production input costs. Japanese import prices have stabilised along with the currency but higher import prices should support the BoJ in their attempts to meet the 2% inflation target for a while at least. Since the start of fiscal 2014, a subsequent decline in demand following the front-loaded increase prior to the consumption tax hike has been observed, mainly in private consumption, such as of durable goods, but domestic demand including business fixed investment has remained firm as a trend. Therefore, a virtuous cycle of economic activity has been operating firmly, accompanied by steady improvements in supply and demand conditions in the labor market. In this situation, the economy has continued to recover moderately as a trend. Looking at domestic demand, private consumption and housing investment have remained resilient as a trend with improvement in the employment and income situation, although a subsequent decline in demand following the front-loaded increase has recently been observed. Business fixed investment has increased moderately as corporate profits have improved; for example, on a GDP basis, it increased in the January-March quarter of 2014 for the fourth consecutive quarter, and thus is growing at an accelerated pace. Public investment continues to increase, due in part to the effects of various economic measures, and has more or less leveled off recently at a high level. The rate of increase for April 2014 registered 3.2 percent, and on a basis excluding the direct effects of the consumption tax hike, it marked 1.5 percent, which is somewhat higher than the rate for March. Given this, the tax increase appears to have been passed on to prices on the whole, on the back of resilient private consumption. As for the outlook, although the effects of the upward pressure from energy-related goods that are directly affected by foreign exchange rates are likely to subside through this summer, the year-on-year rate of increase in the CPI (all items less fresh food), excluding the direct effects of the consumption tax hike, is likely to be around 1¼ percent for some time. The tightening of supply and demand conditions in the labor market is starting to influence wages. Hourly cash earnings of overall employees have started to increase moderately, albeit with fluctuations. According to the currently available aggregate results of wage negotiations compiled by the Japanese Trade Union Confederation (Rengo), wage negotiations this spring are expected to result in a rise by firms, including small firms, of around 0.5 percent in base pay, and about 2.1 percent in overall wages. In order to achieve sustainable growth of the economy, it is important that improvements in corporate profits and increases in demand lead to firms’ active investment. Corporate profits for fiscal 2013 rose significantly. As for fiscal 2014, firms have relatively conservative fixed investment plans at present. However, supported by a moderate increase in exports and developments in the foreign exchange market, in addition to firm domestic demand, corporate profits are expected to continue their improving trend. 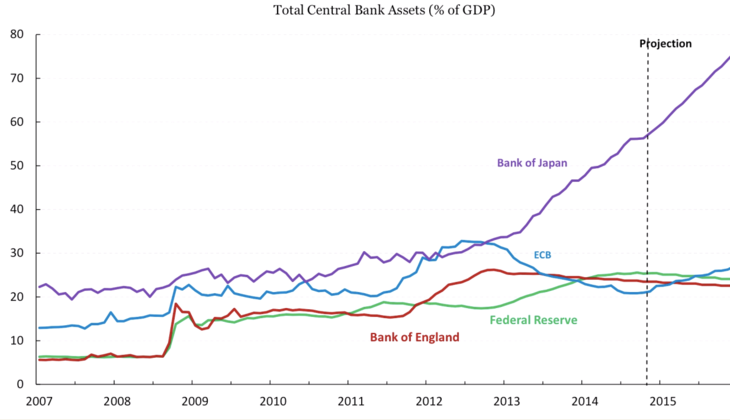 First, with a view to pursuing quantitative monetary easing, the Bank decided to increase the monetary base — which is the total amount of currency it directly supplies to the economy (the sum of banknotes in circulation, coins in circulation, and current account deposits held by financial institutions at the Bank) — at an annual pace of about 60-70 trillion yen, thus doubling it in two years. Second, to achieve this, the Bank has been purchasing Japanese government bonds (JGBs) so that their amount outstanding increases at an annual pace of about 50 trillion yen. In doing so, the Bank has been working on interest rates across the yield curve — including longer-term ones — setting the average remaining maturity of its JGB purchases at about seven years. And third, the Bank has been purchasing exchange-traded funds (ETFs) and Japan real estate investment trusts (J-REITs) so that their amounts outstanding increase at an annual pace of about 1 trillion yen and about 30 billion yen, respectively. … To support full use of the accommodative financial conditions by firms and households, the Bank — in addition to implementing aggressive monetary easing measures — has established the Loan Support Program through which it provides long-term funds at a low interest rate to financial institutions. Specifically, the Bank has been providing funds through two measures that constitute the program: the fund-provisioning measure to stimulate bank lending (hereafter the Stimulating Bank Lending Facility) and the fund-provisioning measure to support strengthening the foundations for economic growth (hereafter the Growth-Supporting Funding Facility). At the Monetary Policy Meeting held in February 2014, the Bank decided to enhance the two facilities. The first criticism is that the year-on-year rate of increase in the CPI is unlikely to reach about 2 percent — the price stability target — in or around fiscal 2015 as forecasted by the Bank. In fact, although many private sector economists have recently revised their inflation forecasts upward, these forecasts continue to be conservative compared to that of the Bank. Since QQE is an unprecedented policy, we understand that there remains skepticism regarding the policy’s effectiveness. However, looking at price developments over the course of the past year, the inflation rate has no doubt been much higher than many had forecasted at the time of the introduction of QQE in April last year. That is, inflation over the past year has been above levels suggested by the relationship between the output gap and inflation data for recent years. This implies that inflation expectations have been edging up. The Bank will therefore continue with QQE, aiming to achieve the price stability target, as long as it is necessary for maintaining that target in a stable manner. Of course, if the outlook changes and if it is judged necessary for achieving the price stability target of 2 percent, the Bank will make adjustments without hesitation. The second criticism focuses on potential difficulties related to exiting from QQE. In particular, there are concerns that, even after achieving the price stability target of 2 percent, the Bank might be obliged to continue its massive purchases of government bonds due to considerations of the fiscal situation. On the issue of exit, let me mention just two points. First, the Bank is pursuing QQE and purchasing government bonds solely to achieve the price stability target of 2 percent. The Bank has no intention to go beyond this objective and monetize government debt. Second, the Bank of Japan is the only central bank which has hands-on experience in exiting from unconventional monetary policy. At the time when the Bank exited from QE, which lasted from 2001 to 2006, I was responsible for market operations as the head of the Financial Markets Department of the Bank. While of course QE and QQE are different, in my view, the Bank already has an extensive range of operational instruments to exit from QQE. That being said, what I would like to emphasize is that the Bank is still in the midst of striving to achieve the price stability target of 2 percent at the earliest possible time, and exit policies should be designed depending on the then prevailing economic and inflation situation. Therefore, it would be premature to discuss the specifics of an exit at this stage. I pointed out that one of the factors behind the rise in the year-on-year rate of change in the CPI is that the output gap has been narrowing and recently has reached around 0 percent, that is, the long-term average. 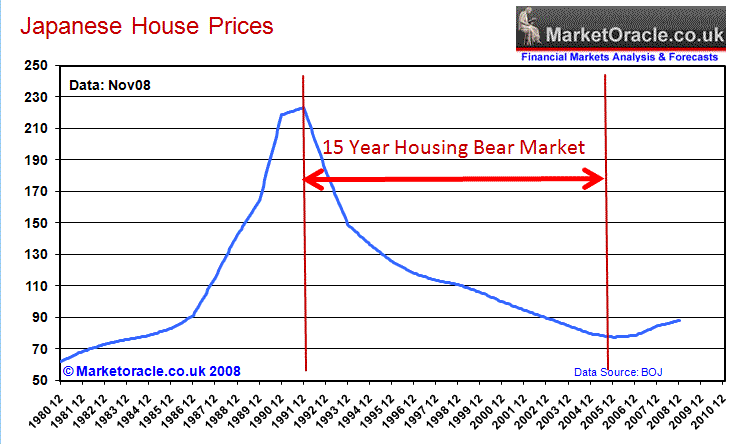 This is mainly due to the increase in demand accompanying the moderate economic recovery. But from a somewhat longer-term perspective, it is also due to a decline in supply capacity in the economy. 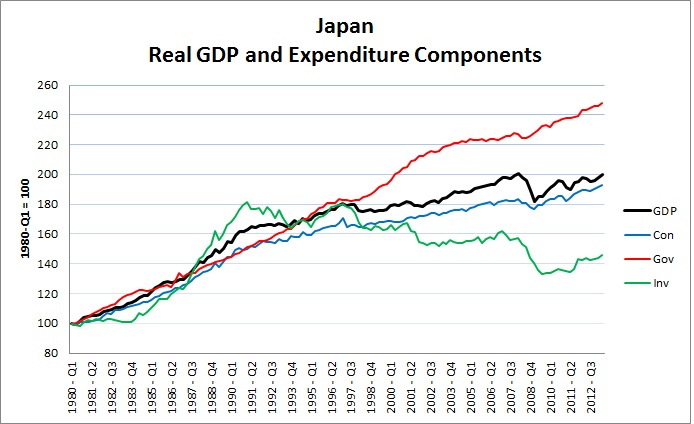 In fact, Japan’s potential growth rate has been on a downtrend since the 1990s. The potential growth rate is determined by the growth in labor input, capital input, and improvements in productivity through innovation and the like. Let me review the trends in these three sources of growth — labor input, capital input, and productivity — that underlie the downtrend in the potential growth rate. First, labor input has been substantially affected by demographic changes. While demographic changes due to aging can be seen in many advanced economies, such changes have been much more pronounced in Japan than elsewhere (Chart 14). These demographic changes have been one factor putting downward pressure on the potential growth rate through the decline in labor supply. Second, capital accumulation has slowed because Japanese firms were weighed down by the need to resolve the problem of excess capital stock during the process of adjusting their balance sheets following the burst of the bubble. In addition, protracted deflation reduced firms’ investment appetite and resulted in the deferral of business fixed investment. Third, productivity growth has also declined. One reason is that while concentrating on dealing with the aftermath of the bubble, Japanese firms were unable to adapt fully to major changes in the global economy such as advances in information and communication technology and intensified global competition. In addition, in the aforementioned deflationary equilibrium, innovation by firms was stifled and productivity growth thus subdued for a protracted period. In its broadest terms the “Fourth Arrow” is “government sponsored” provision of permanent capital to the private sector with the intention of stimulating private sector investment. This could take the form of private equity and infrastructure allocations but will be more substantial, and visible, in the domestic equity market. In fact the process is already well underway both by government fiat and by the “monetary extortion” of negative real interest rates. TheGovernment Pension Investment Fund (GPIF), rather conveniently, raised it target equity allocation from 18% to 26% at the end of 2013. At the end of 2013 fiscal year the fund allocation to domestic equities was 16.47% (JPY20 trn) and 15.59% to international stocks. Domestic bonds still represented more than 55% of the portfolio. 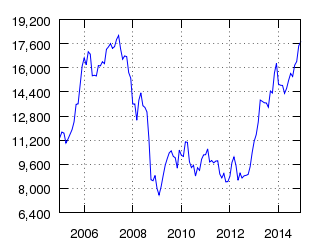 Assuming they allocate evenly between domestic and international stocks, the new capital allocation to Japanese stocks will be of the order of JPY6 trn – but I suspect their will be pressure to invest domestically and the figure will be nearer twice that amount. 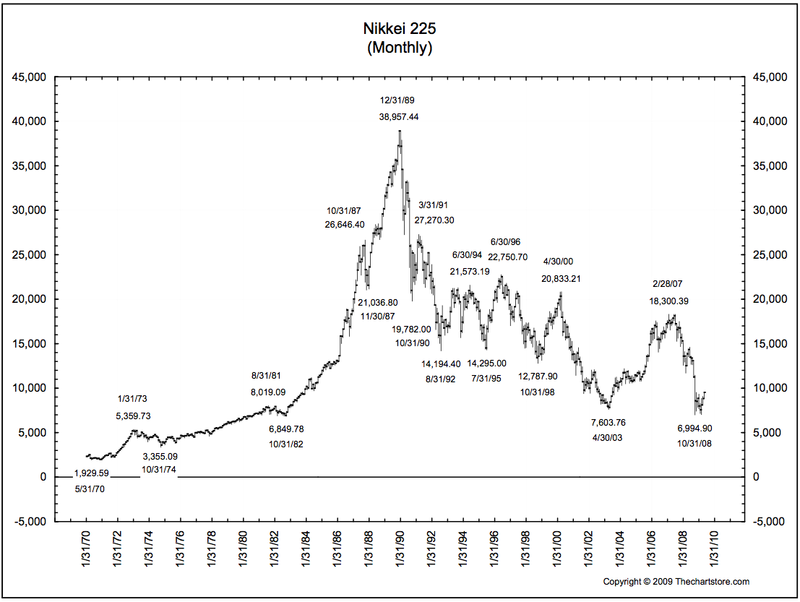 The latest World Bank estimate for the total market capitalisation of the Japanese Stock market from December 2012 was US$3.7trn (JPY370 trn) but the Nikkei 225 is around 50% higher since then. A much larger source of domestic equity investment may emanate from retail savings accounts due to the negative real interest rate policies of the BoJ. 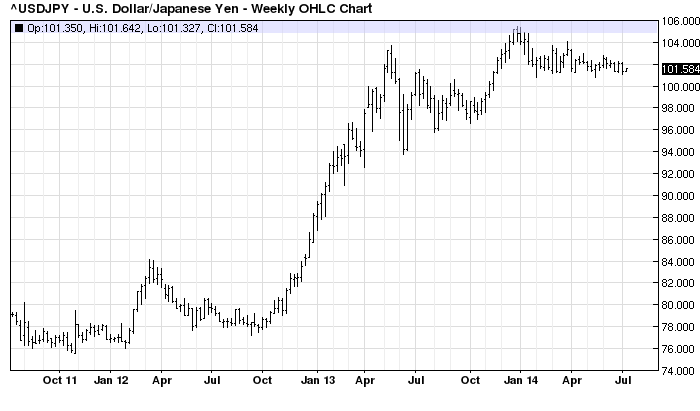 The recent increase in CPI means that the real yield on 10 yr JGBs is now -3.16%. After 2008 JGB yields fell in tandem with CPI but since 2010 this correlation has broken down. The economic theories of Hyman Minsky and Charles Kindleberger suggest that higher levels of debt will slow economic growth if it is skewed towards borrowing that doesn’t create an income stream sufficient to repay principal and interest. This is why I think JGB yields are likely to remain at these low yield levels for some time to come. The Japanese Personal Savings Rate remains at extremely low levels (currently 0.6% vs a pre-1989 level of more than 20%) and outstanding Government debt continues to grow the current ratio of debt to GDP is 227% up from 167% in 2008. From an investment perspective I see little value in JGBs but that doesn’t mean I am bearish – I expect the market to move sideways. Returning to the prospects for the Japanese stock market, another, even larger, pool of capital is likely to be redirected into Japanese stocks. Research by Nomura suggests that retail investors in Nippon Individual Savings Accounts (NISA) could switch up to JPY70trn (around 12% of total stock market capitalisation) of their holdings to equities as a result of negative real JGB yields. Japanese household have historically maintained a low exposure to equities – there is now a real incentive for these investors to increase their exposure to risky assets. Analysis of the cyclically adjusted P/E by Capital Economics late last year prompted them to conclude that the market was already slightly overvalued by recent standards. 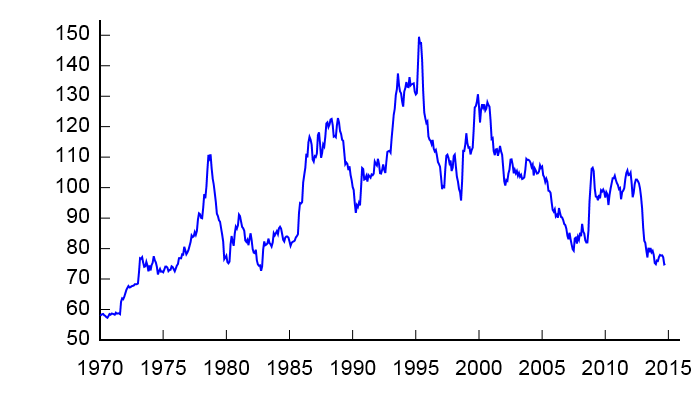 They went on to point out that the late 1980’s boom substantially distorted the average P/E ratios. In other words, stocks aren’t as cheap as the might at first appear. An analysis of the ROE of the MSCI Japan index supports this view – at 8.46% it is ranked 28th out of 32 MSCI country indices. The recent release of Machinery Orders for May at -30.5% shocked economic commentators – it was the sharpest decline since 2005. The stock market took the datum in its stride. Partly as a result of BoJ buying of REITs Japanese real-estate turnover increased by 70% between 2012 and 2013. Land prices in the Tokyo, Yokohama and Osaka have risen this year for the first time since 2008. With other central banks actively seeking to temper the overvaluation of their own housing stock I expect to see international as well as domestic capital flows targeting real-estate. Domestic and international capital will flow into Japanese stocks and real-estate following the lead of the BoJ. The QQE policy of the BoJ will continue to target 2% inflation but the JPY will be subject to a tug-of-war. 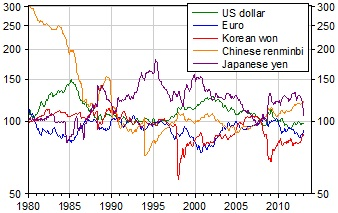 The BoJ’s attempts to weaken the JPY are likely to be undermined by inward international capital flows. 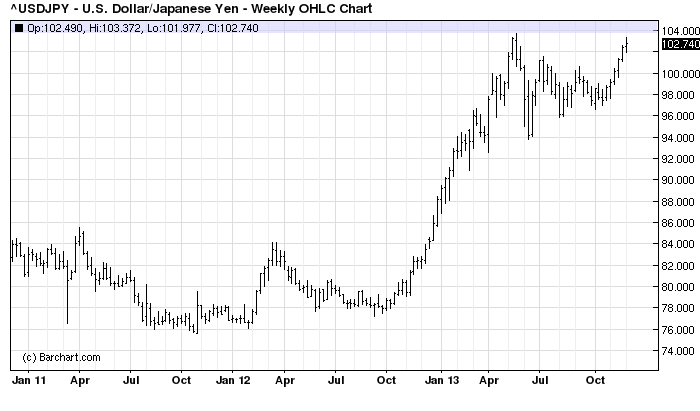 The Japanese government may use geopolitical tensions with China to undermine confidence in the JPY. This article from the AIJSS – The Role of Japan’s National Security Council – may appear benign but I encourage you to read between the lines. JGBs will remain range-bound, real interest rates, negative and growth, anaemic. The beneficiary of the dismal anodyne will be the Japanese stock market which will outperform several of its low growth peers over the next few years.